I do have a bit of a penchant for thrillers that revolve around the hunting down of historical secrets or artefacts and so I was pre-disposed to enjoy The Samurai Inheritance. It is, I believe, the fourth in a series of thrillers featuring art recovery expert, Jamie Saintclaire, although it is the first in the series that I have read. In this instalment, Saintclaire is hired by an Australian mining magnate to track down the preserved, shrunken head of a warrior from Bougainville, one of the Solomon Islands, which, somehow is alleged to have ended up in a German museum. Despite the assignment being a world away from his usual diet of finding Old Masters and other artworks, Saintclaire accepts the assignment. Being led to Tokyo in the company of an attractive museum curator, Saintclaire's quest gets entangled with a mystery surrounding the death in 1943 of Japanese Admiral Yamamoto, architect of the attack on Pearl Harbour. All roads lead to Bougainville and a hidden war in the jungle. 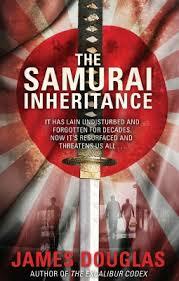 The Samurai Inheritance is a Ronseal book - it does exactly what it says on the tin. Fast-paced with plenty of continent-spanning action, a plausible hero, some love interest, a World War II connection and a devious villain, it's a page turner that won't disappoint a thriller reader who picks it up in a bookshop or the library. Equally, it's unlikely to convert non-thriller fans and it's not one of those books that lasts long in the memory. It was a fun read and, if I saw one of the other books in the series in a shop when I was looking for something to read, I'd probably buy it but I wouldn't go hunting one down. Overall, it's a good, solid thriller for fans of the genre and none the worse for that.